Plant fossils are remains of ancient vegetation, including wood, leaves, pollen, spores, and seeds. 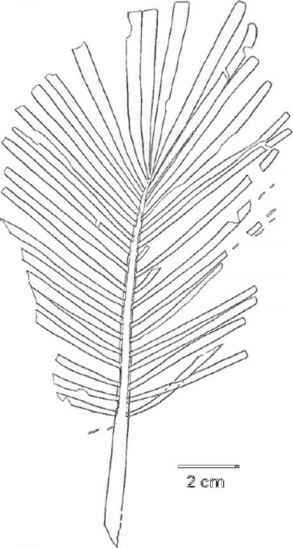 Paleobotany is the branch of paleontology concerned with the scientific study of ancient plants. Because plant remains, especially leaves, are easily rotted and destroyed, they cannot be transported far; hence, fossils preserve a record of local plant life. The Arctic (limited here to the Canadian Arctic Archipelago, Greenland, Iceland, Svalbard, and other polar islands) is a northern geographical region defined by harsh climate. But the Earth's surface is constantly changing as a result of continental drift, explained by the theory of plate tectonics. By studying rocks, and now by direct satellite measurement, scientists know that the land beneath our feet moves by a few centimeters every year. Over our lifetime, this amounts to only a few meters, but over millions of years, these slow movements bring about great changes to our planet. Bathurstia reprinted with permission from Kotyk, M.E. & J.F. Basinger "The Early Devonian (Pragian) zosterophyll Bathurstia denticulata Hueber." Canadian Journal of Botany, 78 (2000): 193-207. For example, 400 million years ago (400 Ma), when the earliest plants colonized land, Greenland lay at the equator. What, then, is meant by "Arctic"? To complicate matters, the Earth's climate changes tremendously over geological time. Only 40 Ma ago the Earth was without ice caps on either pole, and the Arctic tundra biome and therefore the "polar regions" were not "Arctic." Fossil plants discovered in the modern Arctic thus preserve a record of changing life and environment of a vast region, journeying thousands of kilometers over more than 400 Ma, from equatorial tropics to beyond the Arctic Circle. The study of Arctic fossil plants began with the monumental seven-volume work of the great Swiss paleob-otanist Oswald Heer, published from 1868 to 1883. He revealed a polar world unlike today, and posed questions of global geography and climate that remained unanswerable during his lifetime. Since then, Arctic exploration has brought to light rich resources of fossil plants spanning the history of land vegetation. This entry will focus on episodes in land plant evolution of particular significance to our understanding of land environments, and for which the North is well known. Archaeopteris reprinted with permission from Andrews, H.N., T.L. Phillips & N.W. Radforth, "Paleobotanical studies in Arctic Canada: I. Archaeopteris from Ellesmere Island." Canadian Journal of Botany, 43 (1965): 545-556.
did not exist. The oldest fossil land plants are about 425 Ma (the Silurian period). Delicate, small, and restricted to only the most favorable sites, they were rare on the landscape, and they are extremely rare as fossils. Fossils of Silurian and Devonian (about 354-417 Ma) age tell us about colonization of land by plants, bringing about greening of the Earth's surface and making it possible for animals to exploit the land. Well-preserved plants of this age are known from Bathurst Island (Canadian Arctic Archipelago) and Spitsbergen (Svalbard Archipelago), at that time in equatorial latitudes. These plants were very primitive—simple stems without leaves, flowers, or seeds. They reproduced by spores, borne in sporangia (spore sacs) at the tips, or along the sides, of stems. They lacked any way of thickening their stems; that is, they lacked wood, so were herbaceous. 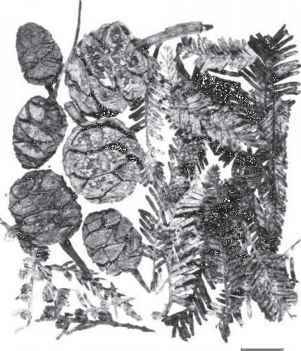 Bathurstia, a plant known from the Early Devonian of Bathurst Island, had robust, spiny stems that ended in dense clusters of sporangia, but even these, among the largest plants of the time, were not even knee-high. By the Middle Devonian (370-390 Ma), as revealed by fossils from Spitsbergen, several types of plants had evolved a means of stem expansion, so they could continue to grow over many months or years, becoming large and tough. 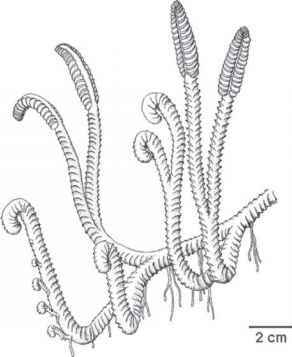 Branches and appendages borne on these stems later evolved to become leaves and seeds. Cycadophyte reprinted with permission from Harris, T.M., "The fossil flora of Scoresby Sound, East Greenland. Part 3." Meddelelser om Gr0nland, 85(5) (1931-1937). These innovations literally changed the planet, as large woody trees formed the first great forest ecosystems, and the Earth's surface was cloaked in dense vegetation. Early amphibians crawled into these forests. Dawn redwood reprinted with permission from McIver, E.E. & J.F. Basinger, J.F., "Early Tertiary floral evolution in the Arctic." Annals of the Missouri Botanical Garden, 86 (1999): 523-545.
descendants the seed plants, which now dominate virtually every habitable place on the Earth's surface. Although these Archaeopteris forests were studied by the Norwegian and Swedish polar expeditions of the late 19th century, it was not till many years later that it was realized that these were not floras of polar ecosystems, but equatorial, and that they were preserving a record of ancient tropical vegetation. Much remains to be learned about these forests, for we know that modern forests host a diversity of shrubs and herbs. 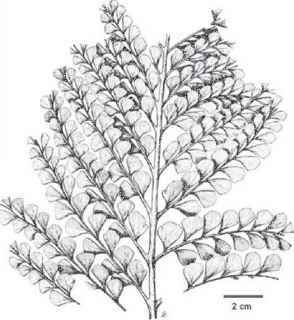 Archaeopteris remains are found with fossils of early club mosses, horsetails, and ferns, such as the earliest known true fern Ellesmeris, discovered among leafy branches of Archaeopteris on Ellesmere Island. Larch reprinted with permission from Bennike, O., "The Kap K0benhavn Formation: stratigraphy and palaeobotany of a Plio-Pleistocene sequence in Pearly Land, North Greenland." Meddelelser om Grönland, Geoscience, 23 (1990). resembling palms. An abundance of cycadophytes often distinguishes Mesozoic vegetation. Among the world's richest sources of Triassic/ Jurassic fossils are the Ittoqqortoormiit (Scoresbysund) deposits of East Greenland, documented by the British paleobotanist T.M. Harris from 1931 to 1937 in the primary work on the Triassic/Jurassic flora of Greenland. By Jurassic time (210 Ma), Greenland had drifted into mid-northern latitudes and was attached to both North America and Scandinavia—neither the North Atlantic Ocean nor Iceland existed. The primeval Jurassic forests of Greenland were dominated by towering stands of early conifers closely related to living redwoods, cypresses, and cedars. Today, in a few places, their relicts persist as survivors from the former cool temperate climate. Entering the bald cypress swamps of southeastern North America, the redwood forests of California, or the coniferous rainforests of British Columbia and Alaska is eerily stepping into the past, to a time of dinosaurs and pterodactyls, the earliest birds, and tiny primitive mammals. Missing entirely from the Ittoqqortoormiit (Scoresbysund) floras were flowering plants, which emerge in the Cretaceous (144-65 Ma), and are therefore relatively young land plants. Nevertheless, flowering plants have eclipsed all other groups, and are the vast majority of plants that surround us and on which we depend. We commonly think of the transition from Mesozoic (Age of Middle Life) to Cenozoic (Age of Recent Life) as symbolized by extinction of the reptiles and the rise of mammals and birds, but the world's vegetation was also being reshaped by flowering plants. As the Cenozoic dawned (65 Ma), world geography was becoming modern, as continents drifted toward their current positions, and the north polar regions took shape. As mammals, birds, and flowering plants flourished, ecosystems the world over began to resemble those of today—except, that is, for the North. More than a century ago, when polar expeditions discovered their remains, it was known that lush polar forests once existed where now there is tundra and ice. This polar fossil record is the most convincing evidence for large-scale global climatic change. Fossil plants of Early Tertiary age (65-40 Ma) are found across the North, from the Canadian Arctic Archipelago, West Greenland, Spitsbergen, Franz Josef Land, Novaya Zemlya, and beyond. Throughout this region, and southward below the Arctic Circle, all lands were covered by similar forest vegetation. Trees were large, in places fossil stumps more than 2 m diameter were found, and from wide annual growth rings in their wood we know that they grew rapidly under a warm, moist climate. Rainfall was plentiful, with lowland swamp forests creating thick coals, some mined commercially on Spitsbergen. Trees included a rich diversity of deciduous species, for example, from the redwood, oak, walnut, elm, birch, and sycamore families. Closest living relatives can now be found in southeastern Asia, southeastern North America, and central Europe, thousands of kilometers south of their former range. Dawn redwood, a deciduous conifer, suitably represents this polar forest, for its distinctive leafy branches are extremely common as fossils. Known as a "living fossil," it is now confined to central China. These fossils tell us much about the origins of modern northern vegetation. 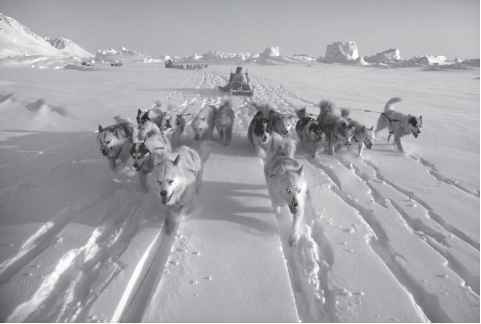 They also help us understand how climate has changed to create the Arctic as a distinct ecological zone. Throughout Earth's history, polar regions have experienced continuous summer daylight and continuous winter darkness. One thinks of the North as Arctic, yet cold polar regions have been unusual in the Earth's past. Rather, high latitudes have been warm, as during the Early Tertiary. Moreover, summers above the Arctic Circle may be gloriously warm. Fossil plants reveal warmth in summer, but also in winter, as living relatives cannot tolerate winters with prolonged, hard frost. Fossil turtles, lizards, alligators, and many types of mammals are also known from these rocks, and alligators, too, cannot survive cold winters. Warm polar winters are the most profound difference between the ancient and modern world. Winter temperatures in the North were mild, seldom slipping below freezing, and then briefly and not severely. Mild winters, without sunlight, indicate a prodigious supply of heat from far south, and a global system of heat storage and circulation quite unlike that of today. Dark, mild winters posed a challenge to plants, for without light for photosynthesis, plants may rapidly deplete their energy reserves. Dormancy was essential, and deciduousness, thereby reducing the plant body mass to absolute minimum, is an effective strategy. Only rarely do we encounter evergreen plants in these fossil floras, an example being cedar, with tiny, scalelike leaves. In 45 Ma fossil forests of Axel Heiberg Island, Canadian Arctic, we see signs of change in polar vegetation, for within typical Early Tertiary forests is the presence of pine, spruce, larch, and other conifers. Although spruces and pines are evergreen, their tough leaves are well suited to winter dormancy, especially when temperatures stay well below freezing. This evidence of chilling polar winters was ominous, for the supply of heat to polar regions was weakening, and world climate was changing. Polar vegetation was transformed during the Late Cenozoic (the past 10-15 Ma), as the old deciduous polar forest was displaced southward, replaced by mixed broadleaf/coniferous forest, with deciduous hardwoods such as walnuts and birches, and abundant pine and spruce. Iceland and islands of the western Canadian Arctic preserve an exceptional record of Late Tertiary forests, the forerunners of modern taiga, or boreal forest. A key factor in this change was the harshness of the winter, which had come to characterize the North. Yet still, forest cover was continuous, and there was no evidence of tundra. By 2 Ma, forests of larch, spruce, and dwarf birch grew throughout the Far North, as fossils at Kap K0benhavn, northernmost Greenland, reveal. In these forests lived bear, deer, rabbits, horses, weasels, wolverine, and beaver, as revealed by 3 Ma bones from Ellesmere Island. The stunted appearance of the trees indicates that they were coping with increasingly inhospitable climate. Today, such forests are characteristic of bitterly cold winters and cool, short summers. Just under 2 million years ago, northern polar forests finally gave way to tundra and ice, as great continental glaciers of the Ice Age grew in North America, Asia, and Europe, and the Arctic was born. The repeated advance and retreat of ice sheets has shaped northern lands, and ice-age climate imposes strict limits on the survival of vegetation. Fossil plants from the Arctic regions document the long decline of global climate, from the northern "greenhouse" of 50 million years ago to the "icehouse" of today, demonstrating, in the most vivid way, the impact of global cooling on northern vegetation. They reveal that the tundra biome, which defines the Arctic, is a geologically recent phenomenon, no older than the first species of humankind. Fossil plants thus provide us with insight into the dynamic history of our planet, and serve to remind us that the only enduring feature of the Arctic is change.